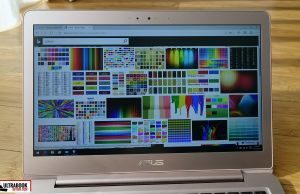 Summary: The Zenbook UX330 checks most of the right boxes and like most Asus laptops, is not very expensive. 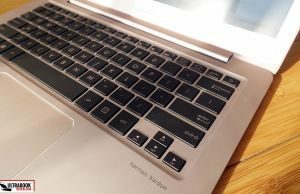 It gets the look, the craftsmanship, the keyboard, the performance and the battery life expected from such a computer, but certain aspects like the screen, trackpad and cooling fan could use more tweaking. Overall though, this is a solid pick if looking for a compact notebook with a matte screen and premium aspirations. 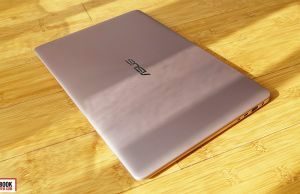 The Asus Zenbooks released in the last year and a half aimed mostly at the average consumer and had the excellent features to price ratio as their top selling point, so it’s been a while since we’ve actually seen a compact Zenbook that could tackle competitors in the premium niches of ultraportables. 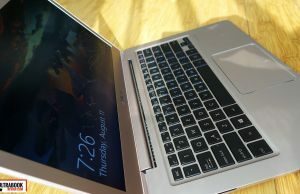 That’s going to change in the second half of 2016, with devices like the Zenbook 3 UX390 or the Zenbook UX330 series, both higher-tier traditional ultrabooks with non-touch 13-inch screens, initially scheduled for release with Skylake hardware and later on with an Intel Kabylake platform. 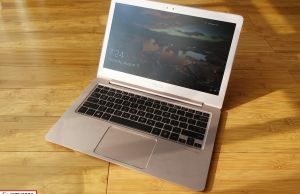 I’ve spent two weeks with a pre-release version of the Zenbook UX330UA model and in this posts I’m going to share with you all my impressions gathered during this time and how I feel the laptop compares to other premium thin-and-lights (like the Dell XPS 13 or the Razer Blade Stealth) or the more affordable Zenbooks (like the UX310 and the UX306 lines). Keep in mind that despite being a pre-production sample, this review unit is identical to the ones you’ll find in stores. Also, if you’re reading the article later into 2017, you’ll still find it useful, as the newer KabyLake and KabyLake-R models are similar to the one tested here on most ends. Follow this link for more details on the latest configurations. The Zenbook UX330 is also available in a multitude of more recent configurations, including models with Intel KabeLake dual-core and KabyLake-R quad-core processors. Follow this link for more details on the latest configurations. 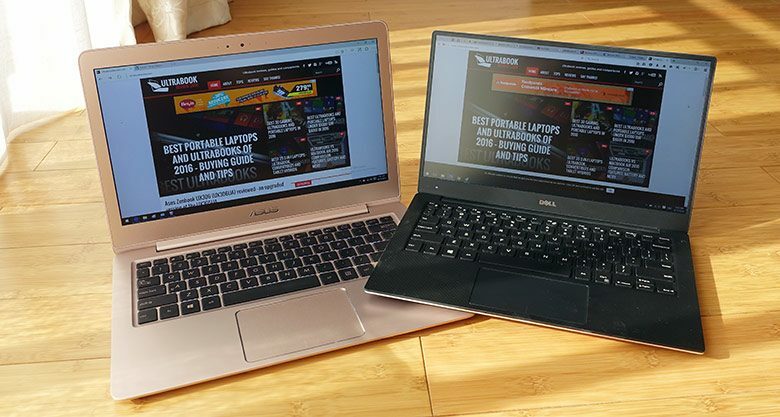 I have the Zenbook UX330 right next to my XPS 13 right now and if I were to ignore the fact that the XPS 13 is more compact, I couldn’t tell which one I like best, as both these laptops have a nice metallic body and feel sturdy and reliable in hand. 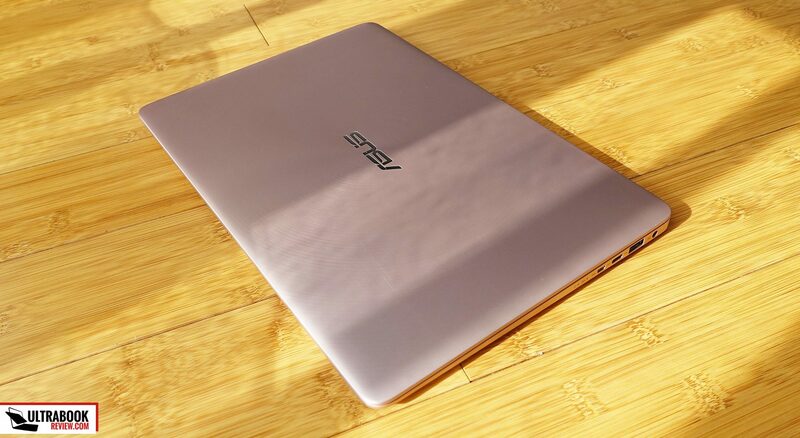 Aesthetically, the UX330 looks like most other Zenbooks, with a fully metallic case, slim profile, simple interior, black keyboard and the radial finishing spurring from the chromed Asus logo on the lid. It doesn’t feel like most other Zenbooks though in daily use, and that’s actually a good thing. 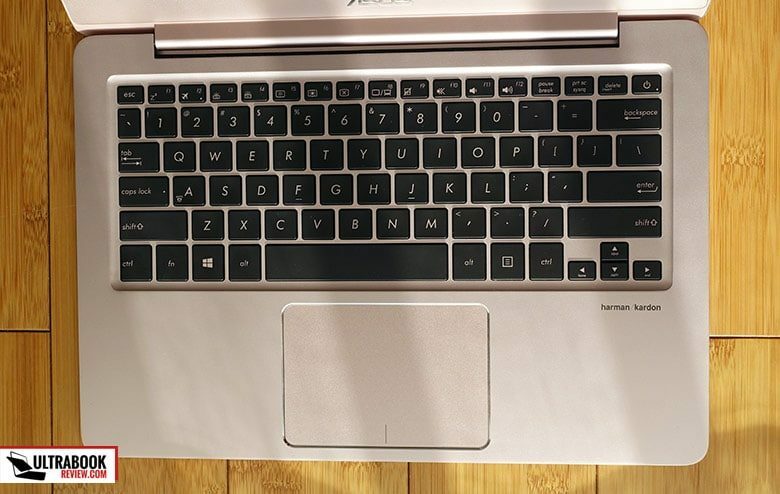 The Zenbook UX330 feels stronger built and more ergonomic than other Zenbooks. There’s still a tiny bit of flex in the hood and the keyboard area, but barely noticeable. If you’re going to read some of my articles about the XPS 13, you’ll see that I always appreciated how solid it feels. 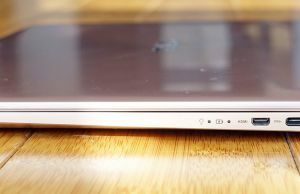 If the XPS 13 would get a 95/100 when it comes to build quality, the Zenbook UX330 would score above 90 as well, while mid-level Zenbooks like the UX305s would score in the 85s in my book. 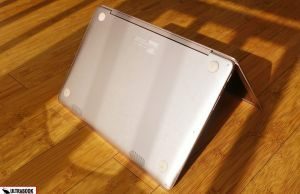 The UX330 still doesn’t get an unibody construction, as it’s built on a plastic inner chassis with metal sheets on top, but the metal used feels thicker and stronger than on other recent Zenbooks. One other aspect worth mentioning is the screen’s bezel. 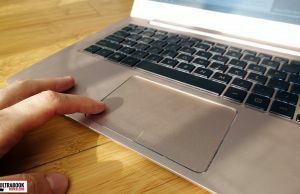 With most Zenbooks (and most laptops for that matter), pressing on the bezel pushes ripples into the panel and the craftsmanship usually translates in contact points between then display and the bezel, which cause light bleeding. With this one, the bezel is very well made, doesn’t bulge when pressed and doesn’t create any bleeding on the panel. Aside from that, the UX330’s general lines are slightly redesigned. The edges are straighter and the laptop has a more rectangular profile, moving away from the feather-like shape of the older models. 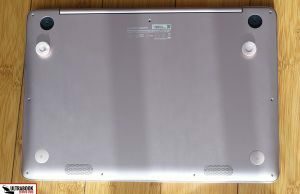 The profile is still slim though, as the laptop is actually thinner than previous premium Zenbooks were, with a height of around 14 mm, including the rubber feet. It’s also lighter, weighing 2.65 lbs (1.2 kilos). Another thing that I like is the fact that you can easily lift up the screen with a single hand, yet the hinge is capable of holding the screen in place well. On the other hand, the display only leans back to about 110 degrees, which I find unacceptable. It’s not going to bother you as long as you keep the laptop on a desk, but I found myself unable to watch the screen heads-on in many other situations, including when having it on my lap. 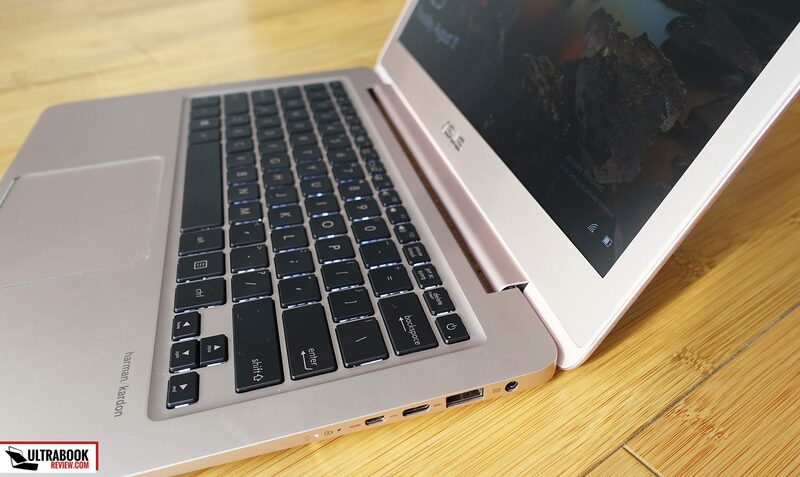 Now, I do hope Asus redesigned the hinge internally, as buyers complained about it breaking easily on past models, and on the UX330 I expect it to see plenty of stress when users would try to adjust the screen’s inclination and hit the dead-end faster than expected. This however is my only major nit with how this notebook feels and looks. The interior is made from matte aluminum and should be quite scratch-proof, while the palm-rest is fairly generous. The edges around are still a little sharp, but thanks to the slim profile, my wrists didn’t come in contact with them in daily use, so I’m not complaining here. The underbelly is simple, with the speakers placed towards the front and four small and decently grippy rubber feet. The back feet are about a millimeter taller than the front ones, giving the device a slight forward inclination. There are no air-intake grills on the back, and we’ll talk about that further down when we’ll get to noise and heat emissions. One particular aspect some of you might not like about this particular UX330 is its Rose Gold color. 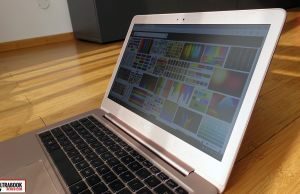 There’s a picture below comparing the crude-aluminum color of the XPS with the pinkish tint of the Zenbook. Asus will offer this Zenbook in a grey finishing as well, but I can’t tell how dark that’s going to be and whether it will show smudges easier. We’ll see. The IO is lined on the laterals, with no ports on the front or back lips. There’s a full-size USB slot on the left edge, the headphone jack and the SD card-reader, while on the right there’s the PSU, another full-size USB port, an USB 3.1 slot, the micro-HDMI connector for video output and two discrete status LEDs. I’d say the connectivity is decent, although you will have to buy an adapter for the micro-HDMI slot and the USB 3.1 is not Thunderbolt 3 compatible, at least on the Skylake version. Kabylake laptops are supposed to offer native TB3 support, so I’ll update this section once those versions are launched in case there’s anything to add. 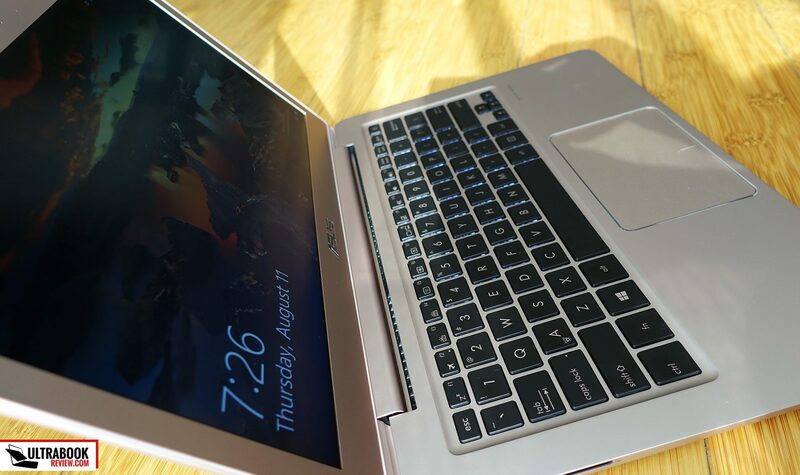 Overall, the Zenbook UX330 is a nice traditional laptop. It looks good and it feels good in daily use, but the screen’s inclination angle make it awkward to use in many cases, which is a trade-of I find really hard to accept on an ultraportable. Based on looks and official specs, the keyboard on the Zenbook UX330 should be similar to the one of the Zenbook UX305, but it actually feels better in daily use, with a firmer feedback. The layout is the same, with tiny arrow keys and the Power button integrated in the top-right corner. The drop is the same as well, at 1.5 mm, which is pretty good for a sleek ultraportable (the XPS 13 gets a 1.2 mm drop, for instance). 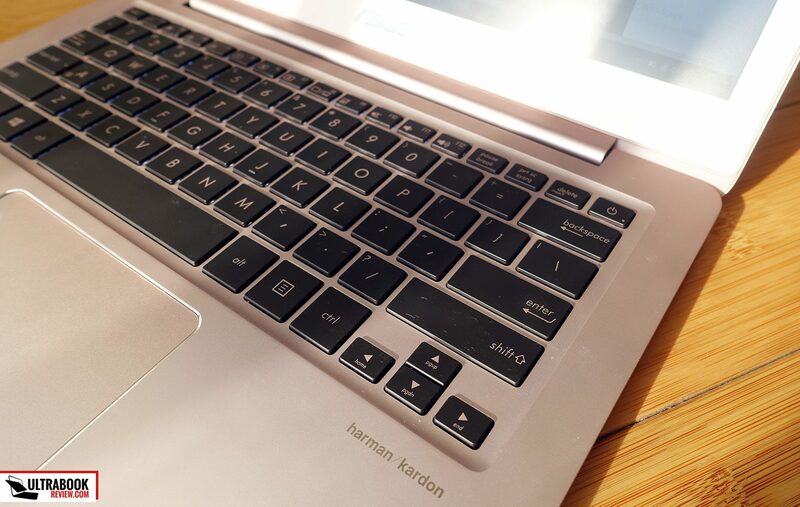 The keys’ finishing is the same as well, matte and a grippy, but what I feel that has changed over other Zenbooks is their resistance to hits, which leads to a more precise click and overall more precise and reliable typing experience. Part of that is due to the somewhat stronger chassis, although there’s still some flex in the frame noticeable while typing, so I don’t think the single cause for the improvement. 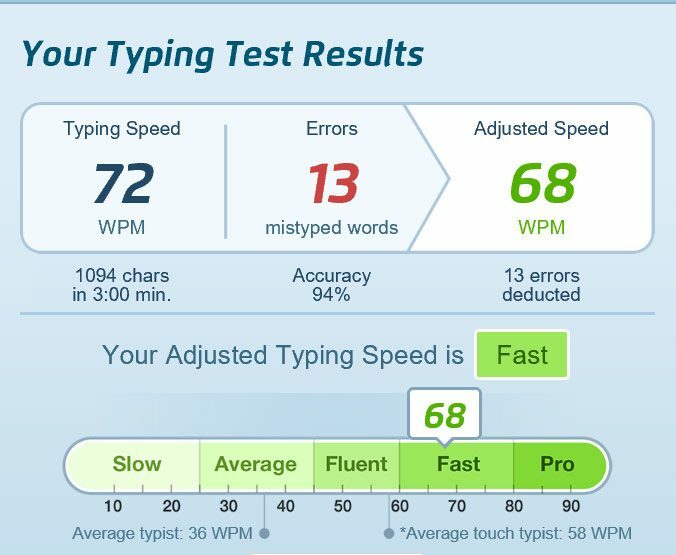 I’ve had the UX330 next to the UX305 just to compare the keyboard, after writing the above paragraph, and I can confirm I was right: the keyboard on the the newer types better. Oh, and it’s backlit this time around, with 3 levels of intensity, and also fairly quiet. 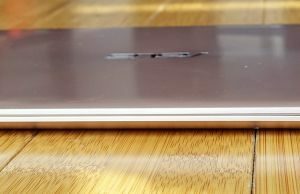 The conclusion is that the Zenbook UX330 types well, with a keyboard experience above average in this class, and it looks that’s the case for the Zenbook UX306 as well, based on the reviews available so far. The trackpad is alright. It’s large, recessed from the palm-rest and with a smooth texture, which means you’ll easily find your way around it even in the dark. It handles most tasks and gestures well, it doesn’t rattle when tapped and the click buttons and quiet and not very stiff. However, because it is a Microsoft Precision trackpad, there are very few customization options available. 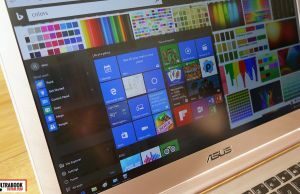 And just like with many other Asus laptops, I struggled with this surface when it came to reaching a balance between everyday speed and accuracy in activities that require high precision, like ticking check boxes in a form, for instance. That’s a software issue and since our test unit is a pre-production sample, it could be addressed on the final retail versions. 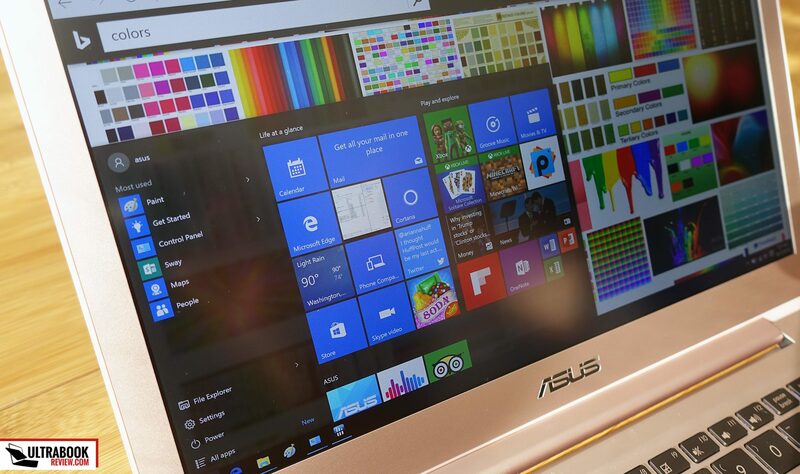 Asus will offer the Zenbook UX330 in stores with either 1920 x 1080 px or 3200 x 1800 px IPS panel with a matte finishing, both with 74% advertised NTSC color coverage, so normal-gamut screens. Our version came with the high-resolution display and it’s a decent option for daily use, as you can see below. 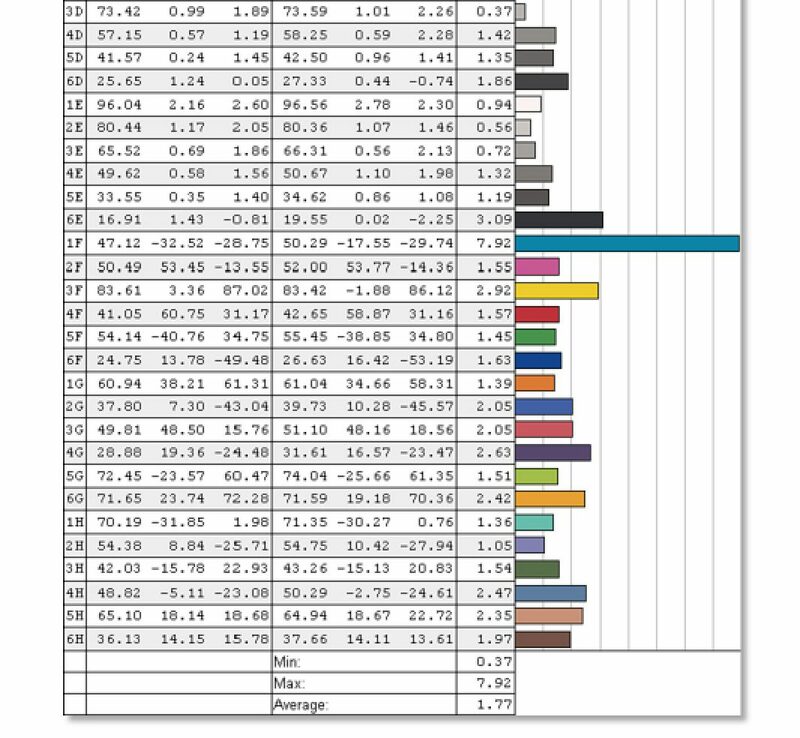 Average DeltaE: 3.33 uncalibrated, 1.77 calibrated. 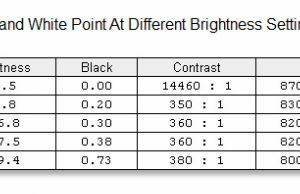 The brightness is good-enough as long as you’ll keep the laptop indoors, but won’t suffice for outdoor or strong-light use, while the measured contrast is poor and the default White Point too cold. We’re using a Spyder4 Elite for our measurements, which is not the most accurate sensor out there, but the low brightness and the fact that blacks are not very deep on this panel are actually noticeable with the naked eye. 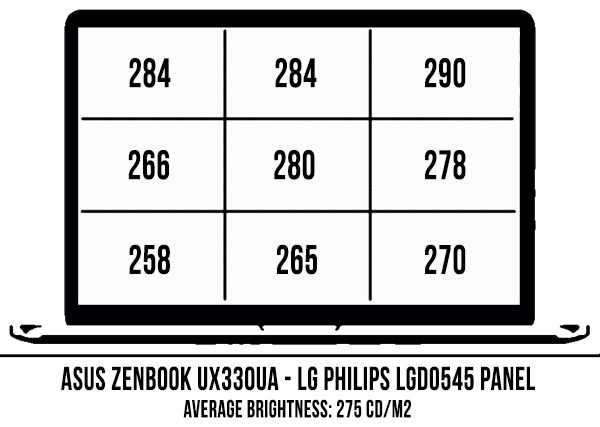 One aspect to keep in mind is that our particular model came with an LG Philips panel, while previous Zenbooks with 13-inch QHD+ screens got a Samsung panel with superior brightness, contrast and color accuracy. For now, there’s no way to tell which panel the retail versions of the UX330 will get, so I’ll update this section once more details are available. It’s worth adding that this laptop comes with a light sensor which automatically adjusts the screen’s brightness based on the ambient light. It works OK, but I prefer to control the brightness manually and usually switch this off from the settings. The sensor was of course inactive in our tests. 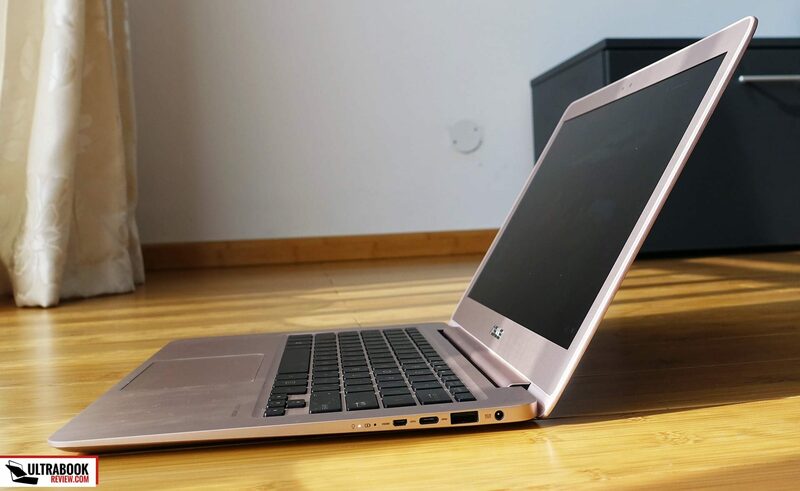 The tested Zenbook UX330UA came with a Core i7-6500U processor, Intel HD 520 graphics, 8 GB of DDR3 RAM and a 512 GB SATA M.2 SSD, which is pretty much the top configuration based on the Skylake platform. I’m not sure if versions with 16 GB of RAM will be available in some regions, those scheduled for my country will only get 8 GB of memory. The RAM is soldered to the motherboard and and not-upgradeable. The storage however is. 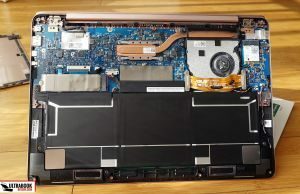 Asus only offers this notebook with SATA 3 80 mm M.2 SSDs, and based on the connector (B+M key), some PCIe SSDs might be compatible as well. If they’re not, then the storage is slow for the premium class, where many other notebooks offer NVMe compatible storage these days. You’re not really going to feel that in everyday use unless you’re going to spend a lot of time installing apps and copying/deleting content, but it’s something to consider. 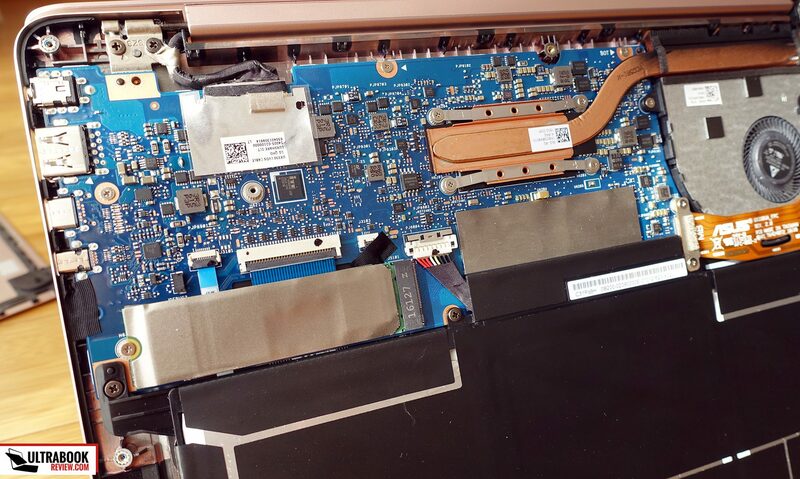 You can access the internals on this Zenbook by removing the back panel. There’s a couple of Torx T5 screws on the sides and two more Philips screws hidden behind the rear-rubber feet, careful how you peel those of. 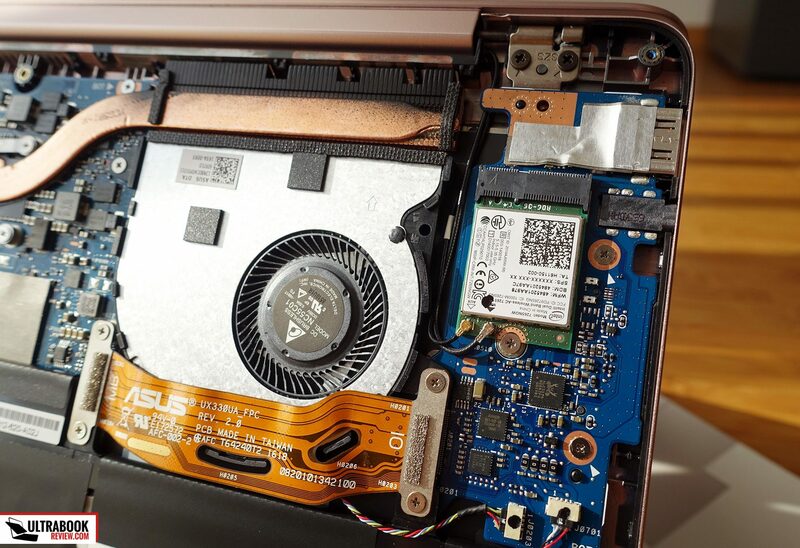 On the inside you’ll notice the cooling system, the RAM, the SSD and Wi-Fi module, the latter two being the only upgradeable parts on this laptop. 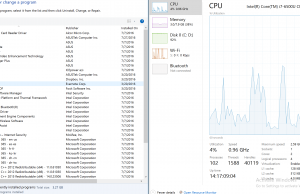 Despite what we consider a “slow” SSD by today’s standards, the tested Zenbook UX330 laptop performed well in daily use, no matter what I threw at it. It’s an Asus though, so it comes with a lot of bloatware that you’ll have to take care of first, but that aside, the experience it provides is solid, with no drivers crashes or any other issues noticed during these two weeks I’ve been using it. I’m not going to post any benchmark results, because this is a pre-production unit and the retail versions will get updated drivers and will perform better. 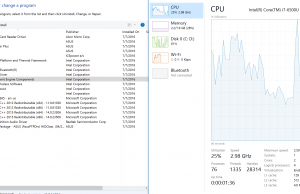 I will tell you that this Zenbook performs just as you’d expect from a Skylake Core U machine, and you can find some details about the hardware’s speeds and temperatures in various daily activities in the pictures below. 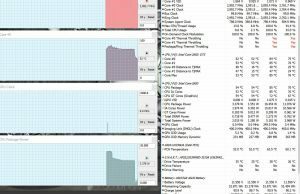 Everything looks solid, and despite the fact that HWInfo signals throttling when running benchmarks, the CPU’s frequency doesn’t drop below its nominal speed. The only odd part is the fact that the CPU runs slow in games, but again, this is a pre-production unit and considering how the other Skylake Zenbooks perform, I don’t expect the retail versions of the Zenbook UX330 to ran into any trouble. 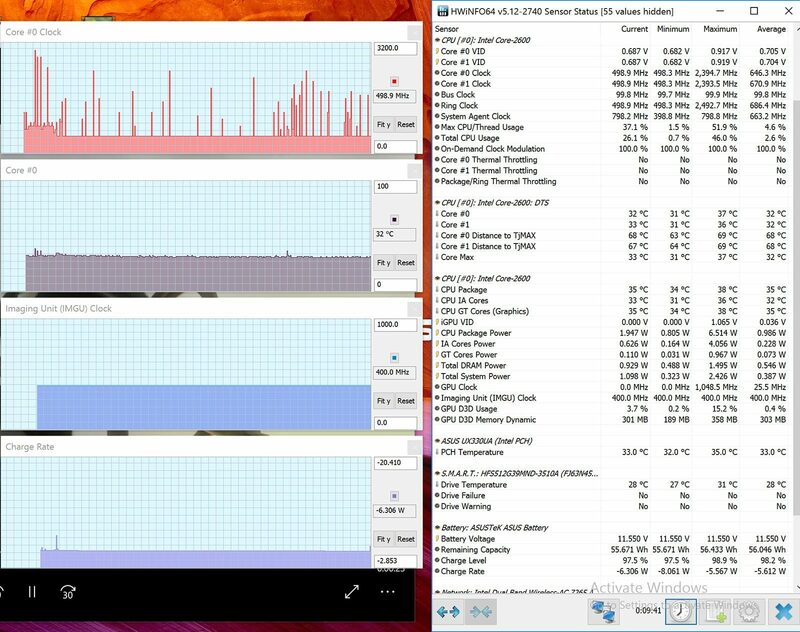 I’ve complained about the unnecessarily aggressive fan in my review of the Zenbook UX305UA and the cooling system is pretty aggressive on the Zenbook UX330 as well, with the fan being active most of the time, even in daily use, but spinning slowly and barely audible in a normal room. 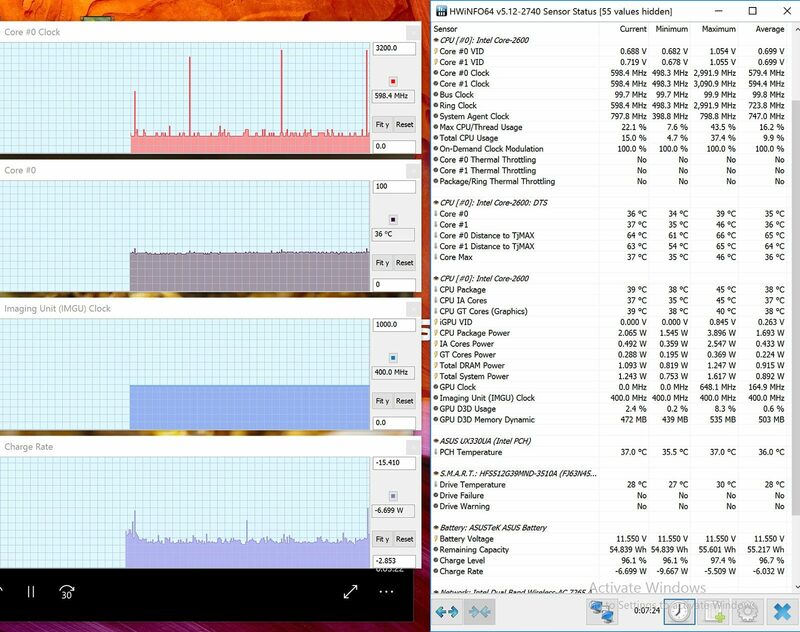 Still, while the noise is not very annoying on this laptop, I expect a premium option to remain passively cooled while dealing with basic chores, as the XPS 13 does. It will probably help to get a Core i5 configuration for that. Both the inner and outer temperatures remain low with daily use, that’s why I consider there’s room for tweaking the fan’s activity on the final products. The case doesn’t get very hot under load either, and the fan doesn’t get very loud, but you’ll still not be able to keep this notebook on your lap while playing games, at least not in a hot climate (like summer is here). Also, keep in mind that load-temperatures might be higher on the final retail versions, since the CPU did not run at its full abilities in games on this test unit. Compared to older Zenbooks, there are no air-intake grills on the belly, with all the cooling happening through the grills hidden under the hinge, but this solution seems to work just fine. Connectivity wise, there’s Wi-Fi AC, WiDi and Bluetooth on this laptop, and I also expect to find an USB to Fast Ethernet adapter in the pack, like on most other Zenbooks. Asus went with an Intel AC 7265 wireless module and it performed well in my tests, with no drops and disconnects. I’ve only used it on a 2.4 GHz connection though, and haven’t tested the Bluetooth connection. 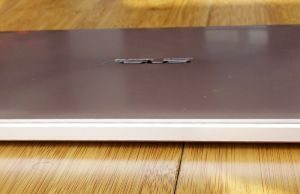 Wireless and Bluetooth performance have been reported issues on previous Zenbooks, but not for me, as both the UX305UA tested a while ago and this UX330UA performed well. 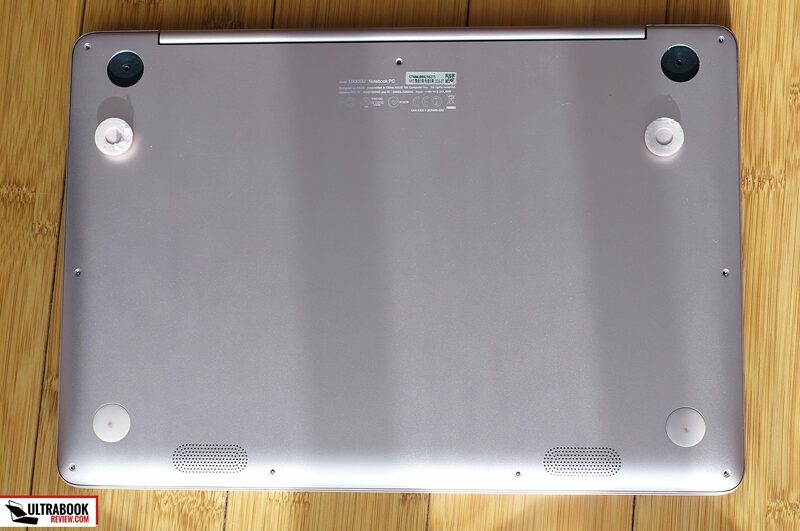 The Zenbook UX330 gets new speakers, with larger chambers and placed on the underbelly but towards the front, not on the sides as in the past. The sound coming out of these speakers is pretty good on the Music setting from the included Audio Wizard app and decently punchy, at a maximum of 90 dB at head level in out tests. I haven’t noticed any distortions or vibrations in the frame, not even at high volumes. However, due to their positioning, the speakers can be obstructed by certain surfaces. For instance, when having the laptop placed on the bed or on a pillow, the audio volume and quality will drop noticeably. Last in this list is the webcam and microphones, both placed on top of the screen, where there’s also a luminosity sensor. The camera is rather poor, as it catches washed out images with little detail, but the microphones do a good job in calls. 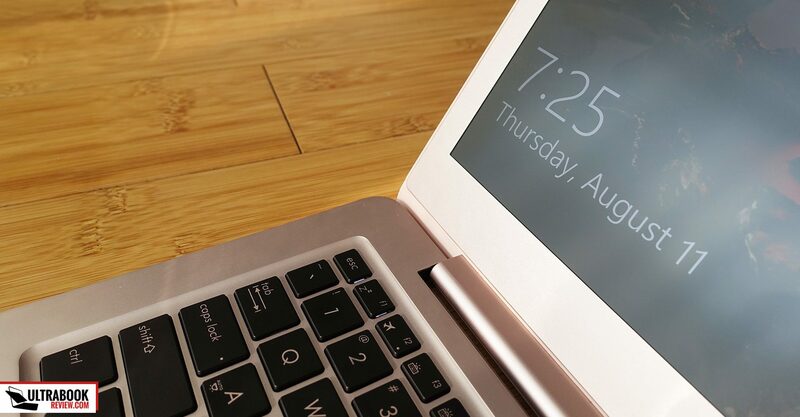 This laptop gets a 57 Wh battery and that’s enough for 5-10 hours of daily use. You’ll find more details below, and I’ve set the screen’s brightness at 40% (around 120 nits) for these tests. 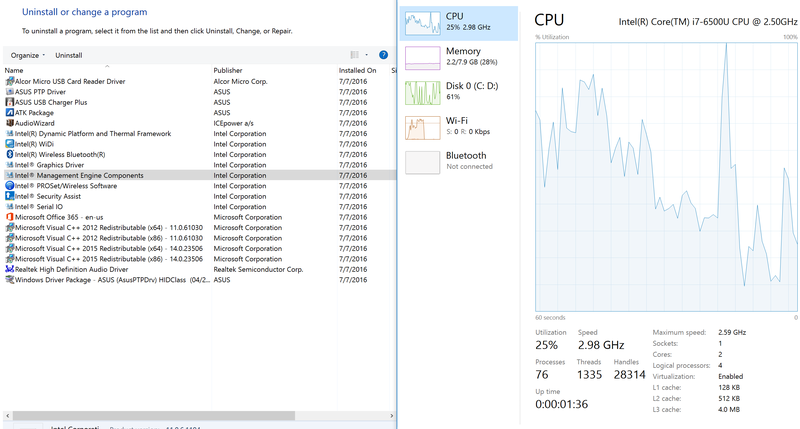 13.2 W (~4 h 15 min of use) – heavy browsing in Edge, Balanced Mode, screen at 40%, Wi-Fi ON. The high-resolution display takes a toll on battery life, so expect the configurations with a FHD display to last longer. 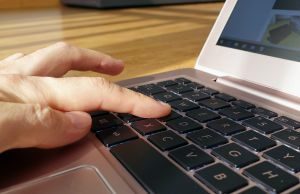 On the other hand, if you plan to use this laptop outdoors or in bright light, you’ll have to pump up the brightness and that’s going to have a significant impact on battery life. Asus bundles the UX330 with a 45 Wh power-brick with non-retractable prongs and a full charge takes around 2 hours and 30 minutes. You’ll find various configurations on the Zenbook UX330 in stores, starting with Core i5-6200U or i7-6500U versions with 4-8 GB of RAM, 256 or 512 GB of SSD storage and FHD or QHD+ displays, with prices between 900 and 1100 EUR. 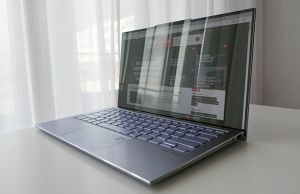 As of 2017, the best-buy configuration with the Core i5-7200U processor, 8 GB of RAM, 256 GB SSD and the FHD screen sells for around 900 EUR in Europe and around $700 in the US. 1100 EUR ($1100-$1200 in the US) would get you a Core i7-7500U config with 512 GB of storage and the QHD+ display. These prices are subject to change and you should follow this link for updated configurations and prices. As of late 2017 there’s also an updated line of UX330UAs with quad-core Intel KabyLake-R processors, with the i5-8250U model going for $750 in the US. Follow the link above for more details, or check out why you should get one of these quad-core variants in this article. Overall, the Zenbook UX330 is a little more expensive than the Zenbook UX305 (which starts at $750 these days) and the UX306 (starts at around $800) and you’re basically paying extra for the superior construction and better IO. It’s up to you if that’s worth it or not. 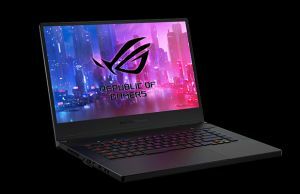 Compared to the Dell XPS 13 ($999 for Core i5, 8 GB RAM, 128 GB SSD, FHD screen) or the Razer Blade Stealth ($949 for Core i7, 8 GB RAM, 128 GB SSD, QHD screen), the Zenbook UX330 is more affordable and the gap gets wider once you speck them up. 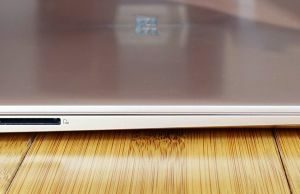 So while the XPS 13 and the Blade Stealth are more compact, stronger built and offer extra features like NVMe storage and a Thunderbolt 3 port, the Zenbook UX330 has the price on its side. 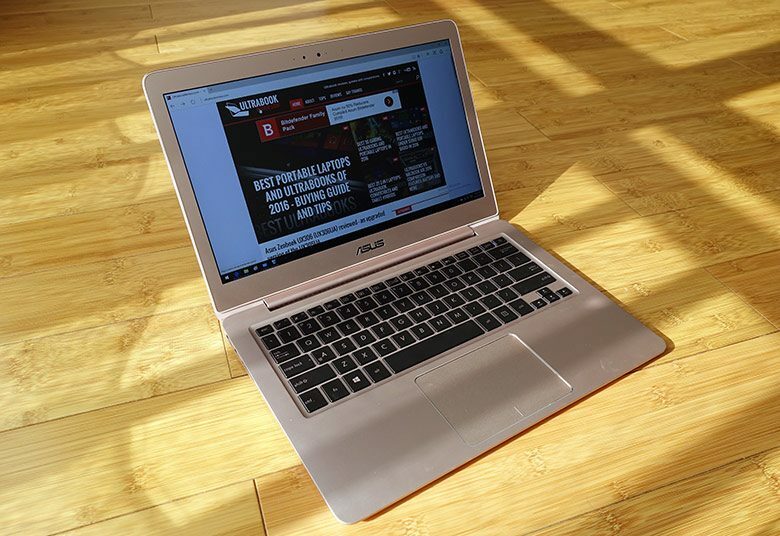 Drawing the line on the Asus Zenbook UX330, we’ll conclude this is a solid option for those looking for a well-priced compact laptop with a traditional form-factor and a matte screen. 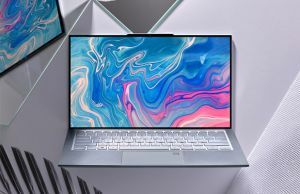 It swims in crowded waters though, with premium competitors like those mentioned before and more affordable alternatives like the Acer Aspire S13, Lenovo ThinkPad 13 or the HP Envy 13. Each has its strong and weak points. The Zenbook checks the right boxes when it comes to aesthetics and overall build quality, gets a good keyboard, performs well, runs mostly cool and lasts for a long while on a charge. On the other hand, its screen could be better, with only average contrast and brightness, the trackpad needs some software tweaking, the fan inside could be less aggressive and the screen’s lean-back angle is one of the most limiting I’ve encountered on a modern laptop. The average user like yourself might not notice all these nits mentioned above, especially if you’re coming from an older laptop. That’s why this Zenbook UX330 gets my overall recommendation and an overall 4 out of 5 mark in this test. Just keep in mind that if you want the absolute best features for the money, you’ll rather find it in devices like the Zenbook UX306, as the UX330 charges extra for exquisite looks and build quality. With that in mind we’ll end this post here. 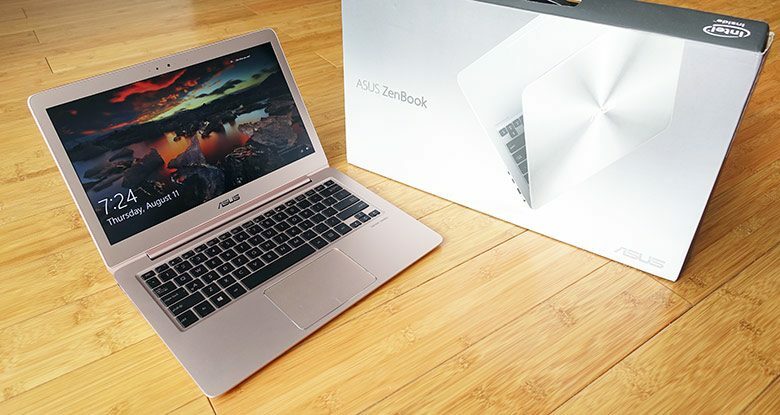 Get in touch in the comments section below if you have any questions or anything to add, or check out our detailed list of recommended ultraportables in case you’re not satisfied with this Zenbook or the other mentioned alternatives and need more suggestions. Hey Andrei, always enjoy your Zenbook posts. Nice to see you got your hands on a 330. What’s the selling point on this over the 306? The specs you posted seem to be the exact same as the 306 that I recently purchased. I7, 8gb, 512. The dimensions are the same as well. I decided on the 306 because at the time it offered the greatest specs while being one the thinnest offerings aside from the 390. I haven’t touched the UX306, but if it looks a lot like the UX305 and if that’s the case, the UX330 has slightly different design lines and feels a little sturdier built. That aside, the UX330 has one more USB 3.0 port. On the other hand, the screen only leans back to about 110 degrees, so it’s more limited than on the UX306. I think the keyboards are the same. What’s your impression of the one on the UX306, is it good or is it shallow? To be frank, I find it very odd that Asus have both these lines on the market. I expect not to offer them simultaneously in the same regions. For instance, maybe they’ll have the UX306 in the US and the UX330 in Europe. Just my suppositions though. I can tell you that it seems to be everywhere here in the Germany (Stuttgart) market, having arrived a few short months ago (3 months to be exact at Saturn). I just bought mine yesterday, and love it! The specs I picked up was the i7/16GB Rose Gold. The UX330 is likely for the Asian market as here in Malaysia we can't have the UX306 and according to the ASUS reps it's the exact same. 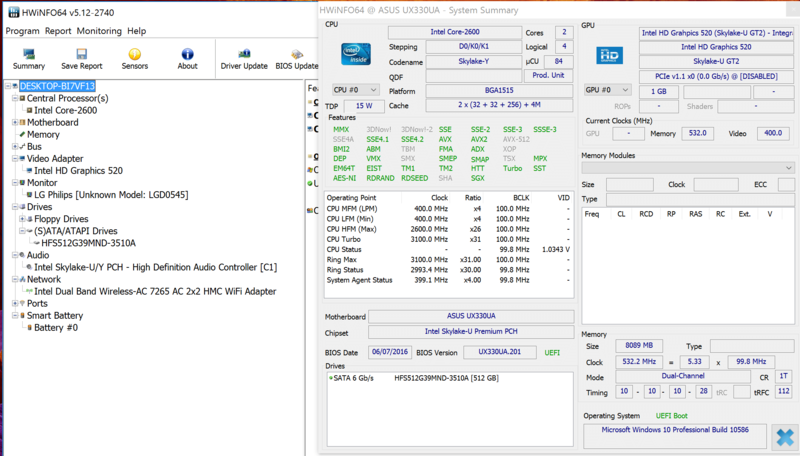 Also, the UX330 does have a -CA model with a fanless core M CPU. I'm not sure if the UX306 comes with that. Does the 110 degree limit bother you when the device is on your lap? Thanks for this excellent review (and your other ones, too). I’m debating between this, the UX306, and the UX310. I want to go Linux-only, so I’ll wait to hear what folks say, and hopefully these models will work as well as UX305 for that. The prongs on the power brick is an unfortunate design. Any chance of a photo of it, to gauge how obtrusive it is? The display color and brightness issue is discouraging, too, so hopefully they’ll go with the Samsung panel and that will improve. I might wait for the Kabylake versions to come out, if that’s not too far into 2017, and I’m still trying to determine whether the i5, like you say, will cut down on fan operation (without slowing things down). Thanks again. The KabyLake version will be available in October from what I’ve bee told. I usually recommend the i5 over the i7, if you’ll look at the tech sheets you’ll see they are similar in most ways, but the i5 is a little lower clocked. It’s well enough for daily tasks, but if you want to run demanding software then you could get the i7. 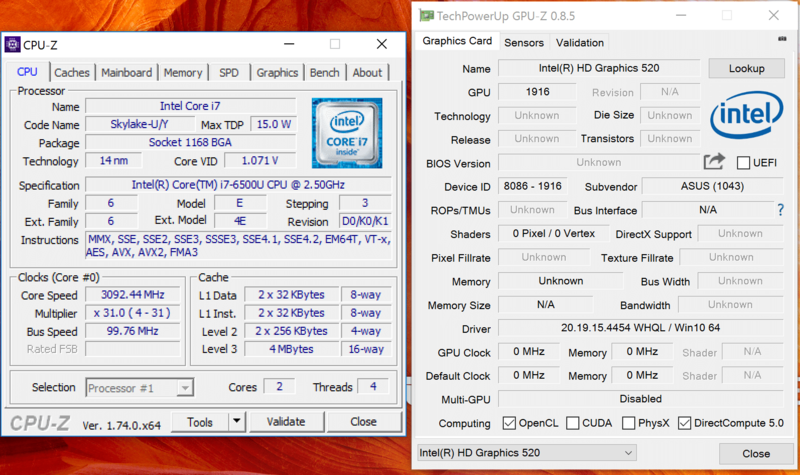 Keep in mind it’s only 5-10% faster than the i5 though, so don’t expect much. I don’t have a picture of the brick but I’ll take on of the Zenbook 3, which uses the same charger, and send it to you via email. Laptop seems good, but i wanna bit more information and opinions about it. Hi, I bought one. I tried to go full Linux on it. A common issue was the display brightness keys which were not working. 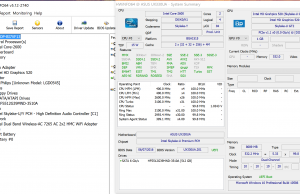 – SolusOs (my favorite) : live works very well. Install fails due to goofiboot. There is a solution for this that I have yet to try. 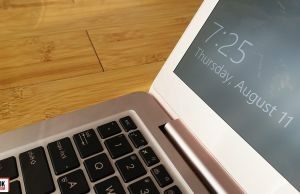 – Fedora 24: works only if USB key is created with dd command. I did not try to install it. I have this UX330UA since last week and installed on the first day a clean windows 10 and a linux Mint 18 cinnamon without issue. I used linuxliveusb creator. Everything seems to work except some FN keys shortcuts, I have the luminosity shortcut near the clock (right bottom) so that’s ok for the moment, the sound FN touch works though. Maybe you had something wrong during the live usb creation. You are right, I certainly made something wrong in the process. Linux Mint is known to be easy to install on most of the computers. As I was more interested in other distributions (LMDE and Fedora), I did not spend time to solve this issue. How come mine worked right out of the box, not including minor bugs. Why do you use a a linux os, if you dont know how to debugg things in order? Is it really annoying? 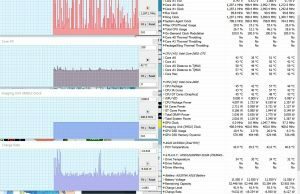 I’m comfortable with old laptop with ~135 degrees and I wanna get almost same experience. It’s OK for desk use. When used on the lap or leaned on thighs while lying in bed or on the couch, you’ll find the angle very limiting. @Desmond: From what I’m seeing, the UX330UA seems not to be a model sold in the US, at least for now, so I’m not really following it until it is. I think most of the Zenbooks are safe bets for Linux, though, based on earlier models. I’m reading your reviews regulary and as well users comments as I’m also interested in buying new Ultrabook. I’ve still not finally decided yet whether to go with UX330 or wait for a review of UX306, or even go with Dell XPS13. However, in the users comments I’ve read something about the power brick. 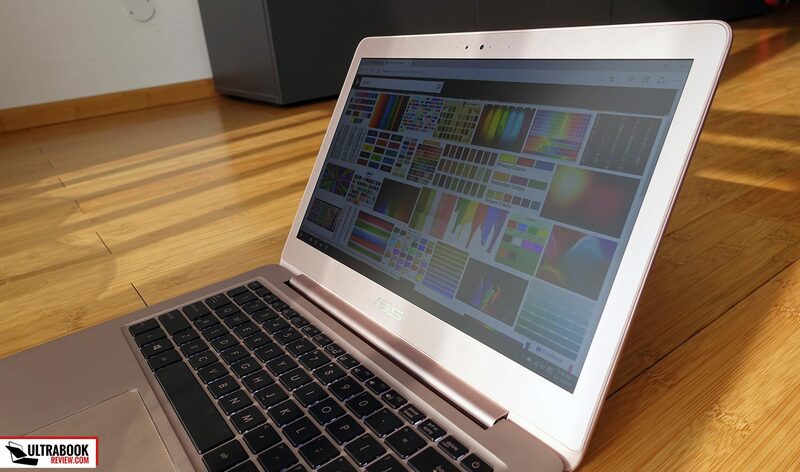 After Google search for Zenbook brick I’ve found out the design as shown on pictures would actually for me be decisive factor against Asus, but I would like to be sure, that this isn’t only US power brick. Would you happen to know, whether EU power brick also has prongs on it? Yes, the EU brick has the same design. Pretty much all Zenbooks have this Macbook like power brick. I will have a picture in the next review of the Zenbook UX390. At first I thought the power-brick prongs would be annoying, but then I realized you could get (or make) an elegant, minimal extension to go from the brick to the wall. Amazon has several such offerings, and also parts to make your own. Now I’m thinking that the trouble caused by the power brick is much less than would be the trouble caused by getting a less ideal laptop. 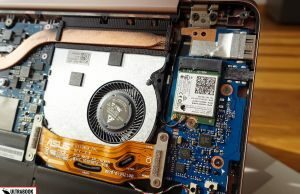 I like your reporting for ultrabooks but i find one part which is very lacking in them yet very important, and this is a review of the performance of the build in I/O ports ESPECIALLY the SD Card reader port. It is important to ensure that the I/O ports are performing as stated and also as expected. This is more so for the SD Card reader port which is now ubiquitously used in nearly all other electronic devices nowadays. 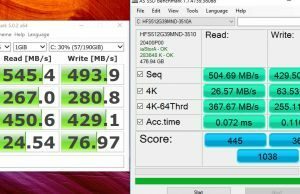 It would help the readers a lot when considering ultrabooks whether the SD Card reader is performing speedily or slowly where they need to consider using the build in or having to carry their own external version or even abandoning the ultrabook model solely for having terrible built in I/O transfers! This is especially relevant to those groups of people who do lots of photography and/or videography when they are travelling or on a trip and would like to carry as few items as possible. Hi, noted. I’ll put this on the list for my following reviews. Can’t do anything about the old ones though. I you have any other suggestions, please let me know, I’m always looking to improve these posts. what was updated please ? If there’s a significant update you’ll find a log towards the top. Otherwise there are just small corrections, typos, etc. If you visit official web site, there is a picture with 16 gb and on a specification it is limited to 8 gb. The model ux306 comes with 16 gb max. Can you pls check it? Only configurations with 8 GB of RAM will be available in my country, but I can’t tell for sure whether 16 GB versions won’t be launched elsewhere. I received it friday and it seems not well ajusted here. Can you confirm there is a problem ? Can you put the picture on imgur? The source you pointed too is insecure, I took out the link. i contacted the support of Asus to get more informations about the amount of ram which can be installed on the UX330UA. I was surprised when the technical support told me that there are 8 GB soldered and the possibility to upgrade to 16 GB. Can you confirm this statement in any case? There’s no spare DIMM and I don’t think it’s placed behind the motherboard. Also, the official specs don’t say anything about that. Chances are the support guy confused it with the UX310? The official specs tell us partially that the UX330UA should support up to 16GB if you take a look at the Overview tab of the asus website. It’s confusing, because at the Overview they write 16 GB and on the Specification site it’s up to 8 GB… Is the picture from the pre-production unit or from a after-release model? is there any update on this machine, especially with regards to Kabilake pocessors and energy consumption of the lesser resolution panel (if it every shows up in Europe anyway)? What I’ve been wondering: Did you ever get your hands on the old UX32VD (I think 32A was the same apart from graphics chip)? I wonder how the keyboard feel, flex around the keyboard, screen tilt and screen brightness (LED display) compare. 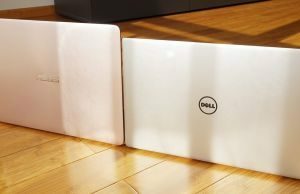 I really love the solid feel of the old one and actually found the keyboard flex of the Dell XPS 13, and most other modern ultrabooks quite annoying in comparison – and I love the keyboard. I also wonder whether the screen tilt really is less than of the old ones as I read that people complained about the limited tilt back then – though for me it never was an issue even though it’s mainly used as a laptop. No update on the UX330. 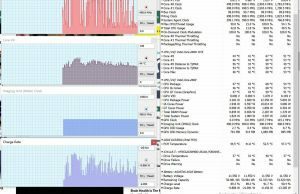 I did review the Core i7-7500U on the UX390UAK, in case you want to have a look, yet the experience isn’t that convincing, giving the cooling on that very thin laptop. I reviewed the UX32A a while ago but I don’t remember anything about its keyboard. 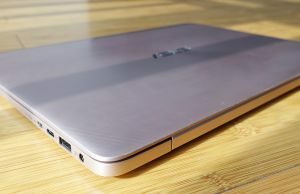 Based on the review ( https://www.ultrabookreview.com/2155-asus-zenbook-ux32a-review/ ) it was decent. The one on the UX330 is an update over the later Zenbooks imo, so I’d reckon it’s an update over the UX32 as well. Also, I’m surprised you consider the XPS 13 to have significant keyboard flex, it’s one of the sturdiest devices out there imo. Yes, there’s some flex if you put a lot of force into the chassis, but I notice no flex at all with daily typing. Thanks a lot for your reply. Maybe I noticed the flex on the xls 13 due reflections on the dark casing in combination with shop lighting or because my old machine feels fairly solid. Who knows. But it’s not my computer anyway as I just couldn’t hit a key even after nearly 30 minutes of trying to write something. Something is odd with that one while I never had that issue with any other notebook before, regardless of keyboard size. I think I’ll wait a bit longer, potentially for the Yoga 910 (Love the looks! 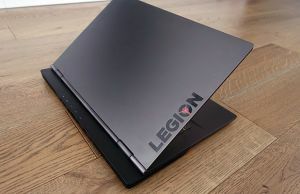 Maybe there’s space for a matte screen protector) and to see if Lenovo gives the X1 Carbon an update, and then potentially order this and the two Lenovos to decide. I decided to order the i5 version for a test. Here’s a quick review without switching it on (I’d not be able to return it otherwise). The casing itself also feels fairly familiar though a bit rounder here and there. The screen has a bit more flex than I’m used to but it’s not wobbling when I’m typing, and I suppose I could still lift it up by the lid. The lid closes perfectly with a satisfying sound. The keyboard seems to have a tiny bit more flex than the old models, though I don’t think it’s noticeable when typing. I wonder if the grey/silver finish mutes visual signs of movement compared to the more shiny dark finish of the Dell XPS. I do think that the flex is a bit more than of the Dell, but I don’t find it annoying. The keys have a slightly shorter movement than of my old computer, though a deeper one than of the XPS 13. It might need a little big of getting used but the keyboard still feels fairly comfortable. The power switch is still on the keyboard to the upper right, just above the backspace key. This was never a problem for me. It might be personal, but I had more problems with notebooks that have the power switch (and other switches) on the side due to me using it as a laptop with constantly changing sitting positions. I never accidentally hit the powers switch this way when lifting up the notebook or moving it into a slightly different position. While I’m quite happy with this computer in it’s shut down state I’ll still send it back as I’m hoping for a i7 with bigger harddisk, or potentially a Kaby Lake version. And it would be good to see a few more reviews pop up, especially with regards to battery life and screen quality. Hi, thanks for the feedback, other buyers should find it very useful. I was wondering if the UX330 was compatible with Windows Hello face authentication? I’m a longtime MacBook Pro user who needs to buy a Windows ultrabook for work (office, emails, browsing etc). I was originally drawn to zenbooks due to their lightweight portability, style and price tag. But now I am confused by all the different models. I would prefer not to spend as much as I would for a MacBook Air or dell xps 13, but don’t want to end up throwing away money on only a half decent ultrabook. Is it better to wait for the new zenbook 3 to be released (I am in the UK) and see if the older zenbooks are reduced? Or will they become obsolete soon? The reason I wouldn’t get the UX305UA is the fact that it doesn’t get a backlit keyboard. Otherwise, the hardware bumps of the newer versions are only minor, but the keyboards on them are much better. Does the USB Type-C port on this laptop support video output? (I got the FC006T configuration if that’s important). I’m basically asking because I know I will need HDMI and VGA output from this computer. Will I be fine with a USB-C to everything (Ethernet, VGA, HDMI, USB) adapter which I plan on buying, or should I rely on the micro-HDMI port for video output? I haven’t tried it and I’m not 100% sure of this, but it might. This is not a Thunderbolt 3 port though, but even so it might be (in theory) compatible with VGA and DisplayPort 1.2 with the right adapters. Can’t tell for sure without trying though, take this with a grain of salt, I might be wrong. Hi, did you manged to try it and is it possible to use 2 monitors with this laptop? One with HDMI and one with USB Type-C? Hi, I just purchased this laptop yesterday. The USB-C port is GEN1, which means you won't be able to drive power or video output through the port. Im however successfully using a USB 3.0 HDMI dock on it (By Plugable) just fine. Though, I wish I could use my USB-C dock with it. I'm trying to find UX330 in Europe, with i5 (Skylake) CPU, 8GB RAM, 256GB SSD, FHD display and English keyboard, however there aren't any available. Do you have some info about overall availability of UX330 in Europe? Where they taken out of the supply chain? When are they planned to be in stores in Europe? It's available in some regions in Europe, just not everywhere. I don't have any insiders on availability other than what I was told and what I mentioned din the post. The ASUS ZenBook UX330CA-PURE4 (13,3" FHD Intel m3-7Y30 / 8GB / 256GB SSD / Intel HD 615 / Win 10) is at least available in Scandinavia and Swiss. Price around € 1000. Just fyi: the i5 model is currently available at Amazon.co.uk for 670 pounds, reduced in price by about 100 pounds compared to when it was available last. One a handful of items available though. Thanks for the info. I've noticed in UK there are only QHD versions, however I'm looking for FHD version and i5. Andrea: Are there any news regarding the panel in production version? Do they get Samsung panel or the one you didn't like in your review? Are both, QHD and FHD, of the same supplier, or is FHD Samsung's panel? 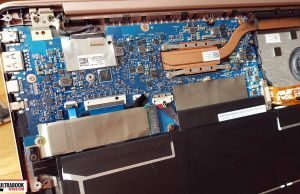 Where did you get info on the panel supplier for reviewed laptop? There is nothing on Asus site (on Specifications tab). You can find this info with HWInfo or from Device Manager. Hi, trying to work out the reason for choosing this over the ux310ua. As I gather the 310 comes with same processors, cheaper and has room for upgradeable ram? Is the 310 just a better build with a usb-c? Yes, but the UX310 gets a TN panel according to many reports, which is more than enough reason not to get it imo. If you can confirm it's available with an IPS panel in your region, then you could at least consider it over the UX330. Andrei, would you happen to know, whether the keyboard can be replaced (by service provider)? As English version is not available, I would purchase the one with German keyboard layout and then got it replaced with English keyboard. I don't have any experience with this but I'd reckon the keyboard could be replaced, however, that's only if you can find the English version anywhere. Hi, between an UX305UA i5-6200U QHD+, 8GB, 256GB at 750 EUR and UX330UA QHD+, i7-6500U, 8GB, 512GB SSD at 950 EUR which one you will recommend for a student? Office, Google docs and email. No games. Hi, You should ask yourself if 256 GB of storage space is enough for your needs. If yes, I'd get the UX305UA. Otherwise, you can consider the UX330 instead, which has a better keyboard imo and it's a little sturdier built, but for your requirements the Core i7 processor in not necessary. 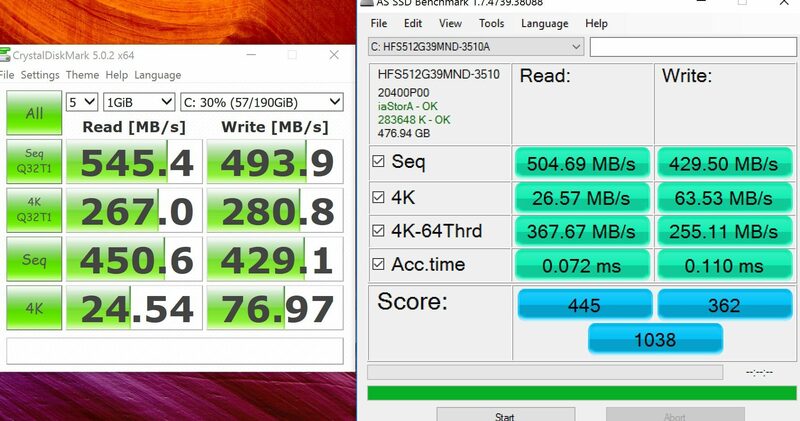 I'm seriously considering the UX330, but is it possible to upgrade the SSD storage without voiding the warranty? I can only seem to find it with 256 GB, but would prefer 512 GB. RAM also tends to be 8 GB, although I have seen one or two with 16 GB, which I would prefer. Is the RAM soldered on? the RAM is soldered and upgrading the storage is simple and normally shouldn't void warranty, but it's best you ask the local Asus representatives. What do you think about bad comment on Amazon, when some people face issues with hibernation, screen lock, etc etc. There are plenty of 1-star reviews. Do you think they are fake, or realy, Asus laptop is similar to lottery? Looks to me like Amazon actually merged the old UX305UA comments with those of the UX330UA, thus only the most recent ones (October or later) actually speak of the UX330. 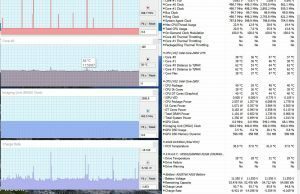 I don't use hibernation and I can't comment on this aspect, however I had no issue with putting this laptop from sleep and resuming when needed. 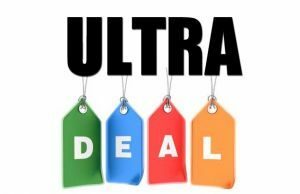 Can you recommend the UX330UA with i7 for buying? Or there is some better device at $1100? I'm from Paris. Here they are selling a version of the UX330UA as GL110T, for 850 €. It comes with a i5 kaby lake, 8GO RAM and 512 Go SSD. The thing is, for the description of the display the seller annouve a 13,3" LED Back-lit, Ultra Slim 250 nits, FHD 1920 x 1080 16:9, AG. And some French web sites are saying that it's a TN Plus display…. Can you tell me anything about this display ? Do you know about a TN display for the UX330UA ? What is a TN Plus display ? Asus also offers a UX310UA model, which actually comes with a TN panel. Not sure what a TN Plus panel means, but probably a slightly better TN panel with improved contrast and color accuracy. Viewing angles are still going to be problematic, no matter how good the TN panel is. Hi Andrei. Thanks for you answer. 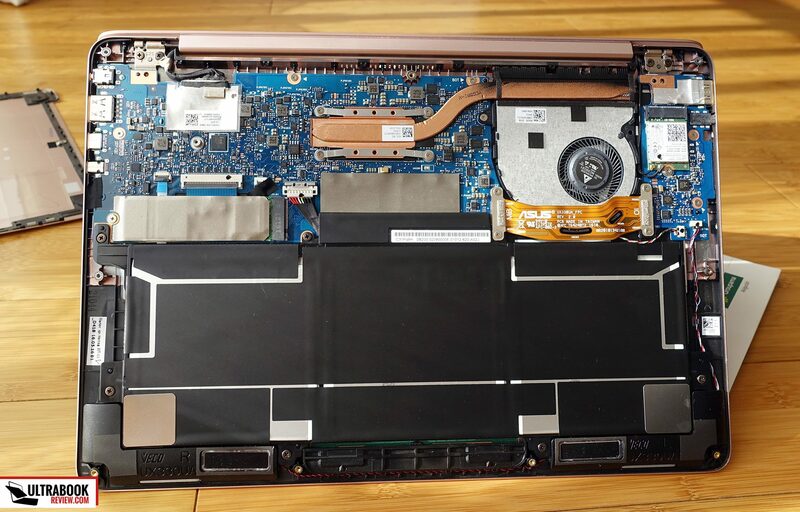 One of my French folks who just bought this zenbook configuration told me this afternoon that the one he has doesn't have any angle dark view problem. For him this panel is definitely an IPS. So it seems to be an IPS Display afterall. Don't know why this french dealer shows a TN display for this model. please give me a solution ! i want a much reliable one! Hard to say which is going to be the more reliable one, I'm sorry. What I'd do is get extended warranty for both, given how they are expensive. is it good to buy kabylake version of Asus ux330? and Asus is cheaper so I think I can get the extended warranty under my budget. on paper for me both seems to be powerful , hope u had hands on n worked with both ,what u would suggest (value for money).? and Amazon says ux330 has the fingerprint sensor. is that included in new kaby version ? i can't see that in asus site. you can find the specifications of the new UX330CA. 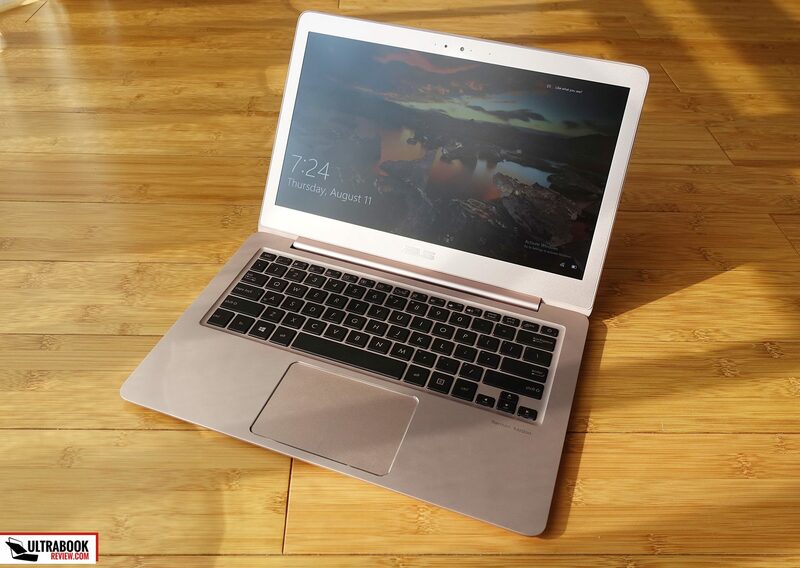 I see as a great advantage the fanless design but at the same time a disadvantage if you want to use the laptop for your own advanced photo and video processing. Wish you succes with your choice aravind! True, that's because the UX330CA is built on Core M hardware. The UX330UA is however built on Core U processors and a closer match to the XPS 13.
this is one is ua edition and it says it has the fingerprint . Is this the correct description ? Hi everyone, I just bought, and am typing on the new Kaby Lake version of this laptop. Reading through these comments, I see that some people are wondering about the screen, and how Kaby Lake performs. 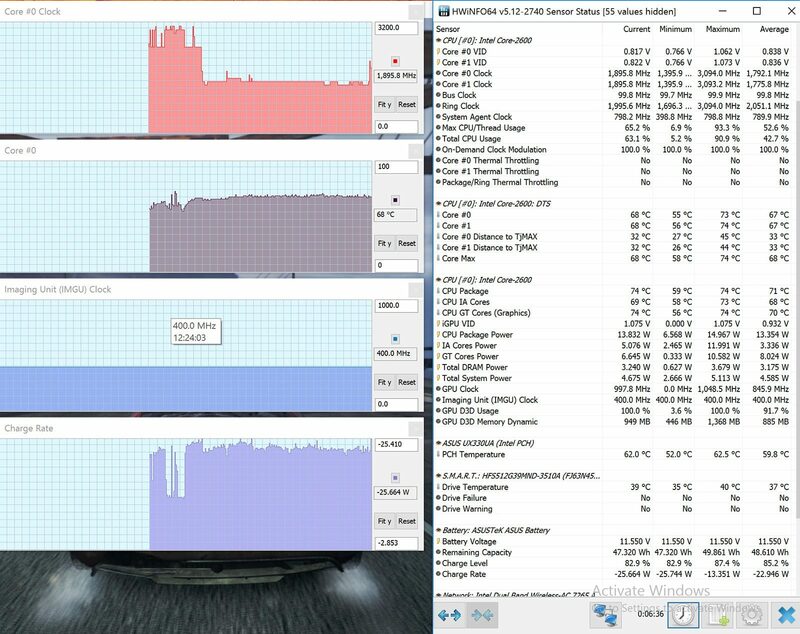 The fan is pretty aggressive still, and I have the i5 version. It's definitely noticeable, and if you care about noise it will get on your nerves (e.g. it spins up more than it has to and more aggressive than it has to). It's winter right now and the case was icy cold, and the fan still spun up. The screen is an IPS panel from some no name manufacturer, "AU Optronics, Model: AUO272D. The battery life is stellar, I have probably 6 or 7 hours of screen on time, watching YouTube videos and browsing the web, and I have 32% of the battery left, which Windows expects to last for 3 more hours. If you have any other questions, ask me! I am in the US and bought it from Amazon, it's cheaper than the UX305 right now, which is great! Thanks for the feedback David, much appreciated. It's a shame Asus can't get their heads around those fans, they're aggressive across their entire line of ultraportables. How aggresive are they ? can you record it with some db meter? 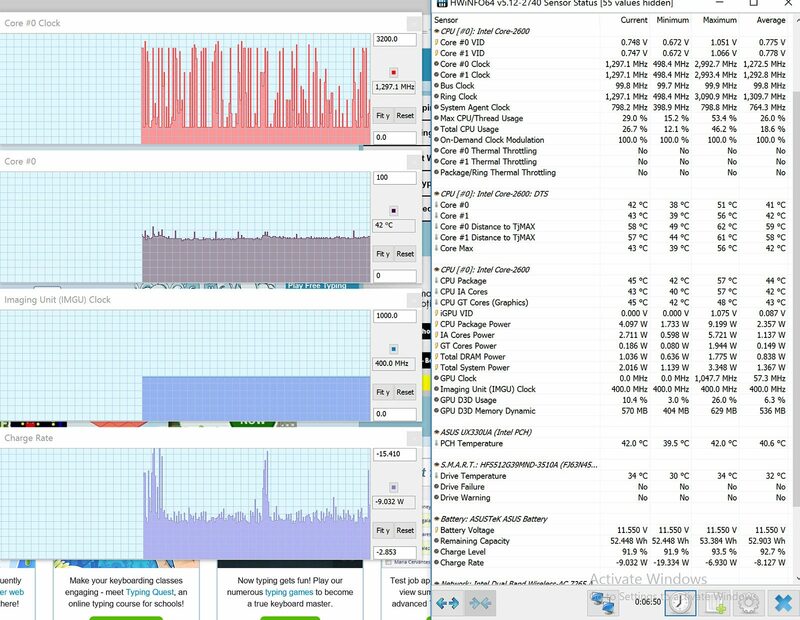 i'm on the fence between two ultrabooks. also, is the display good ? backlight bleeding? yellowish tint ? I don't have a dB meter, sorry. 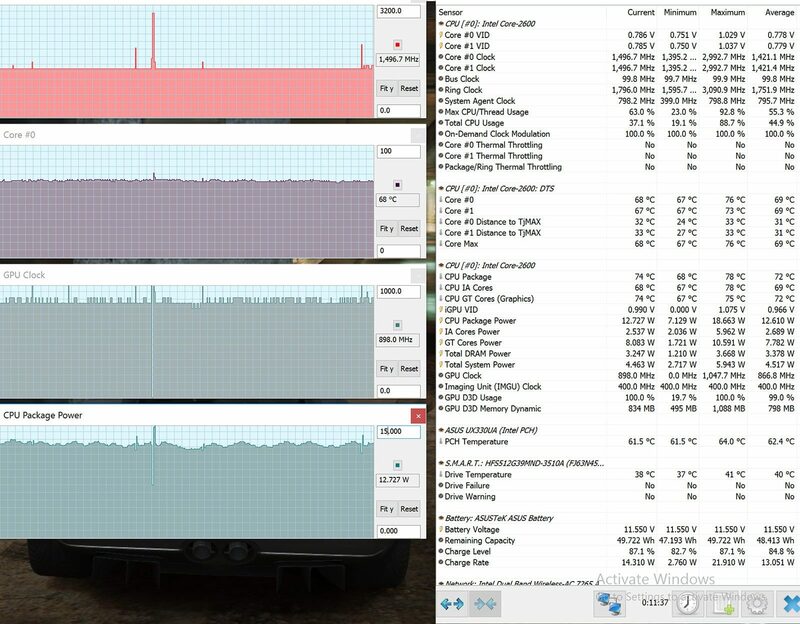 At idle the fans are usually very quiet, but at 100% load it is definitely noticeable. The display is great, there is no backlight bleeding, and no yellowish tint that I can see. avoid the notebook like the plague. i thought i'd give Asus a chance but clearly it's a stinker of a notebook iteration up till today and i've since returned it and got a dell xps 13. – the lcd monitor does not flip backwards enough, it'll constantly annoy you if you're used to ANY other kinds of notebook before. anyone taller than 5 feet 6-9" will have a terrible stiff neck using this ultrabook with its limited display angle. – SD Card transfer speed @ 30MB/s!!! this is 2017 for goodness sake, it's time to discard such old components already and switch to high speed SD card interface component. 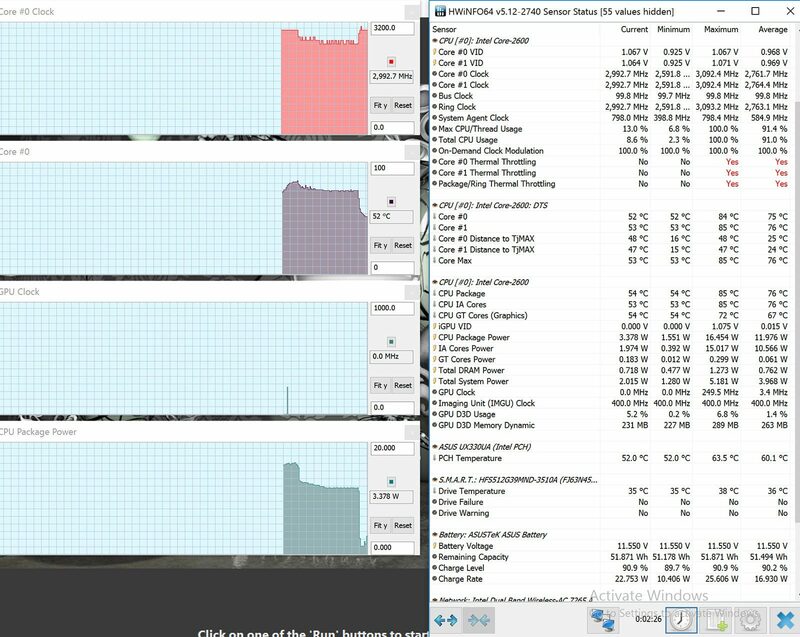 i can get 100+MB/s transfers with the XPS 13. Unfortunately, in Germany the laptop isn't available with a 512 GB SSD but with 256 GB only. In your picture I see that the included SSD is covered with aluminium. Is the aluminium glued to the SSD or is it removable? It's just a removable piece of thermal tape. Loved the review and I am considering getting the kabylake version. I only have one question. If I buy a type c to HDMI dongle, would it work on this laptop or is the type c port only for data? That's a good question, but unfortunately I don't have a sure answer for you. Theoretically, USB Type C can output video and audio signal, so it should work, but I'm not entirely sure that's possible on this laptop and I haven't tried it either during the test. Sry I can't be of more help. If u need an HDMI, get micro to normal HDMI jack !! than buying type c converters! I already have that. I was planning on getting a dock setup with a dongle that connects my monitor, speakers, peripherals, etc. through the type c port. Can you tell me if the display on Kaby Lake models for QHD+ variant has improved in terms of contrast ratio? I am planning to buy this in India but not sure what kind of panel are they using. They say it is 178 degree wide viewing angle, 100%sRGB etc but God knows how is the display. I'd reckon it's the same panel. Yes, i bought the product(QHD+,512GB,i5 7th gen) here in India and looked up the model number of display in HWinfo tool, it is the same panel. But honestly i didn't feel like blacks were washed out on the display. You know what is more worse is the fact that here in India, Asus is selling the FHD(i5 7th gen, 256GB) variant without IPS panel(because they are not specifying Wide Viewing Angle Display on them). So, what Asus is doing in India is that FHD variant is without IPS and QHD+ variant is using cheap LG-Philips panel as Andrei pointed out. Both are priced closely. 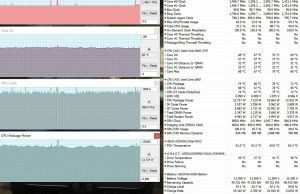 Did you experience heating issues and thermal fan kicking in too frequently even on lighter web browsing. I am facing this issue. They have rolled out a BIOS update for this but that is valid only for BIOS model number:UA not UAK. Unfortunately my BIOS model is UAK. Check here. If your BIOS is UA model, you can update your BIOS. The update clearly says it is for Thermal Policy. 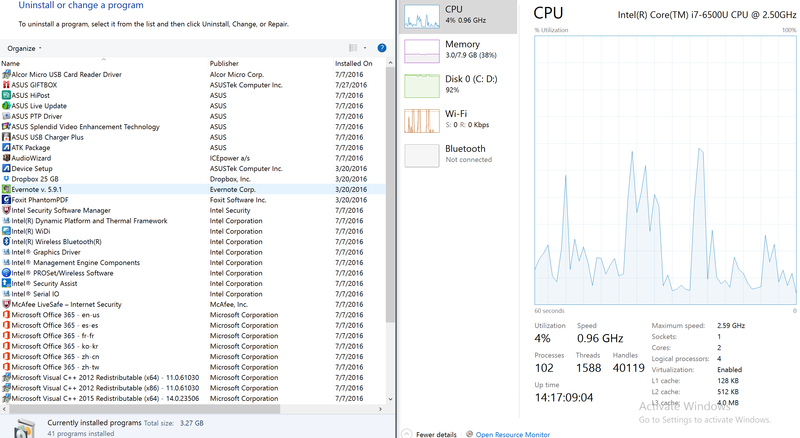 I got the lap from US (zenbook ux330ua ah54)so ur saying i can update the bios ? Sorry mine us UAK as i looked in systemInfo it says ux330uak .. The noise is not a problem. I don't mind if the fan runs intensely when Windows is updating which you can hear. But i have noticed that even when I am not doing something demanding, the fan is always running. It is silent and you can barely notice but it is always running. My concern is battery impact this fan will have as it will always draw power. My unit is QHD+ screen so I am already falling short in terms of battery when compared to FHD Screens. 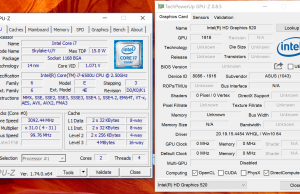 I opened my BIOS settings and kept it opened for 5 minutes, the fan was always rotating at ~3500rpm. Is it normal? Did you face such issues? hi! i have the same notebook just with hd screeen (not qhd). and i have the same problem with fan. it rotates ~ 3500rpm most of time (its loud and consume more energy). i see the bios update with thermal policy but it's for UA model, unfortunately mine is UAK. Did you solve your problem in any way? (i'm on linux now). Hi Andrei, just wanted to share this. 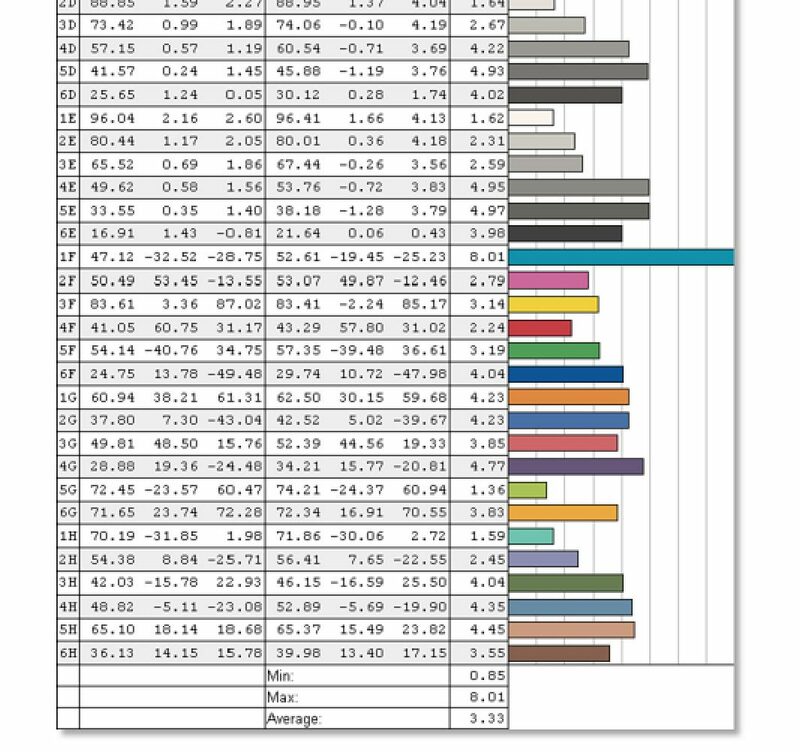 You know i noticed one thing, with default values in Intel Graphic Properties there wasn't much of a difference between dark shades(Here is the site which i referred lagom.nl/lcd-test/contrast.php ). On my laptop the shades numbered 1 to 4 on this site, all looked the same. I calibrated my display from Intel Graphic Options(tweaked contrast and brightness) at a point so that I can see shade 1 clearly and now the display looks better than before. I sensed this when i was looking at various UI elements of Windows. I had a background wallpaper of rain forest where all shades used to looke dark green,brown and black. Now, the same wallpaper looks so different than before that i could differentiate light green and dark green shades. What are the differences between the UX330UA an the UX330CA? The UX330Ca is built on Core Y fabless hardware, a little slimmer and lighter. The UX330UA is built on fan-cooled Core U hardware. So I ended up getting one of these (after two years on an rMBP 15). 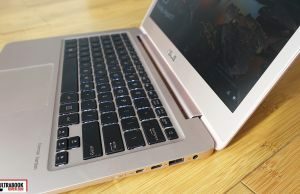 First impression was, well, 'quartz grey' means more of a pink in Asus world, lol. Some people have said it's so slight it's hard to notice – I don't agree, it's definitely decidedly pink and not grey, even if it's a light pink. A non-issue for some, some will like it, it's a bit too toyish for my liking. But, bigger issue for me, the trackpad. I've read a lot about microsoft precision trackpads and how much better they were than others, so I'm not sure if it's the Precision trackpad or the hardware Asus chose for it, but I don't find it all that great. Scrolling feels laggy and motion doesn't reflect your fingers well, and both that and pointing can't seem to distinguish involuntary hand movement we all have from intended motion, making fine detail movement a pain. Keyboard action is fine to good, with just a few layout gripes I could get used to. The screen is decent but marred by an overly grainy antiglare film. Display hinge is overly loose and moves when picked up, but hasn't been an issue while typing. Can't find a way to make media keys default over function keys in the UEFI. I think this will be going back within the return window. Does anyone know if trackpads within the MSP program are better, or they're all like this one? Do you find the 110 degree screen lean angle annoying and limiting? Thanks! so good luck Ladies and Gents…would not recommend buying one. How does it compare with Lenovo IdeaPad 710S in terms of value-for-money and performance? Also, I have heard the asus ux330 has some issues with the trackpad. I didn't notice any issues with the trackpad. The trackpad is smooth and responsive. (Microsoft animations are laggy eg. 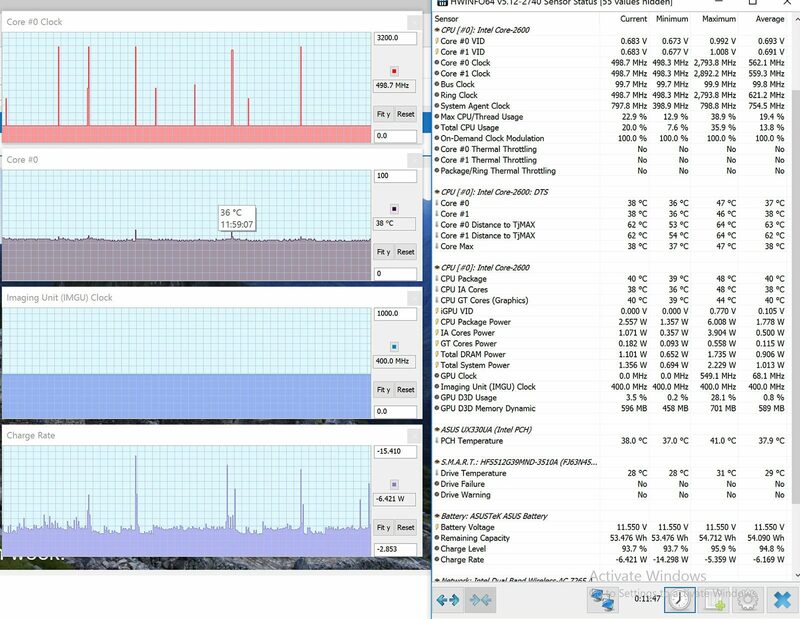 switching between windows) It is slightly over sensitive if i were to say. What i mean by that is that sometimes when you want to drag something, a minute delay(in ms) in deciding(whether you want to tap or move) would make trackpad register it as a Single Click. I was planning for Lenovo Ideapad 710s but it hasn't been launched in India yet. On their Lenovo India Site, it says 'Coming Soon' for the past 6 months. Definitely Asus UX330 has better battery(57WH) and form factor(13mm thickness,1.2kg weight,metal build) than Lenovo Ideapad 710s(if at all it makes to India). I have called number of Lenovo stores and nobody knows when is it going to launch not even Lenovo India Sales team. I say at 83,000 INR , 4K IPS Display, i5-7th gen,512GB SATA SSD,8 GB RAM is apt for money(if not worth) considering that it is an ultrabook and ultrabooks are expensive in India than rest of the world. Hello. Thank you for your review. I have a go-pro camera and need to edit HD footage once in a bluemoon. Would the 330 or even the 305 be able to handle such editing? On another note, would the dell xps 13 also be able to handle it? Other than that i only browse and watch movies. 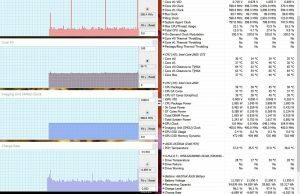 Im torn between asus 330/305, dell xps 13 and the yoga 900 and the decision would be primarily based on which one can handle this tiny bit of editing that i need to do. Your observation about the lack of tilt in the monitor for asus has put me off somewhat. All these laptops should handle basic to mid-level projects fine. Make sure you get at least 8 GB of RAM though. 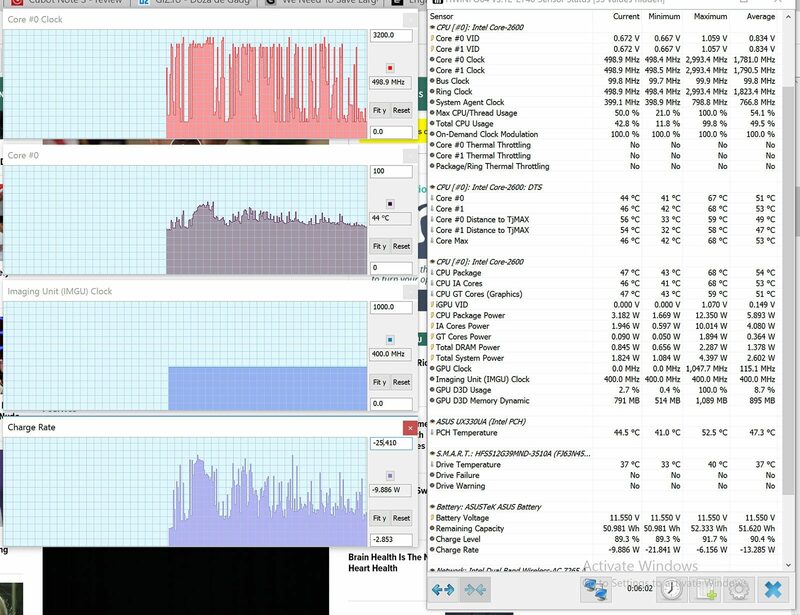 the Core i7 processor would also help if you want to render things a little faster. Is the rose gold edition not available in the US or something? I am searching high and low for a non black or non silver one and I have come up empty! Also debating between the Asus ux310ua and the ux330ua, will be using it for medical billing and coding school can anyone help? I got my hands on UX330C notebook yesterday. While I was impressed by the sleek look and the performance. One thing bothered me today morning that is, on the backside of the notebook the surface cover was having a slight bulge near the joint. When I closed the notebook, I noticed that the bulge was evident. to be precise this is exactly on the right side of the top screw and below the fold . I called the customer care twice and they told me its the design, but its not convincing. Can you help. That area gets heated up on constant use for more that 45 mins. 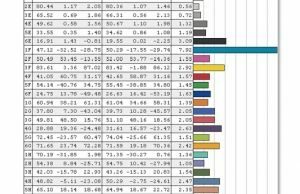 Hey, why does your contrast differ so much from the one on notebookcheck? Theirs is 1636:1, while yours is 380:1. We're using a different, cheaper sensor. 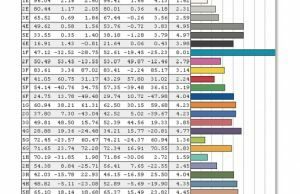 Notebookcheck are a much bigger publication and afford better tools, so their results should be more accurate. 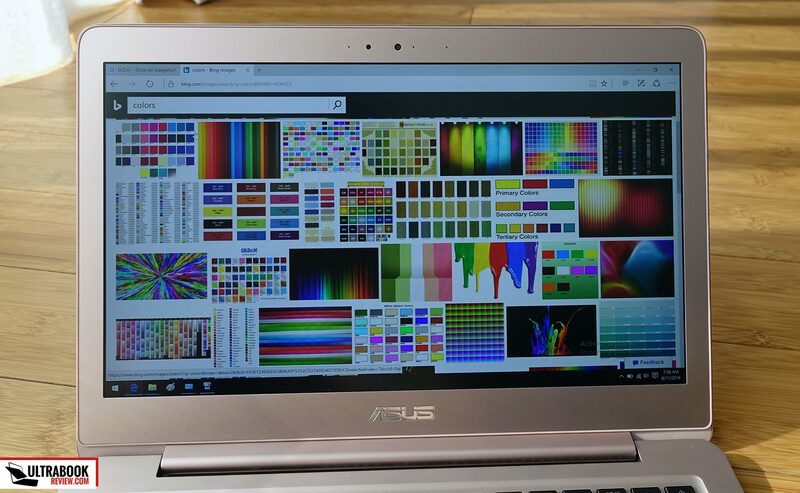 Don't you have this laptop's calibrated color profile (.icc) left? Need it badly for exactly the same screen panel. No, I didn't save the icc file at that time. I'm missing keys all the time, I tested the keyboard and I noticed that when you press the key just in the corner is not recorded, this doesn't happens with my ux305. Somebody else also noticed this and made a video youtube.com/watch?v=yFsL0PDMwS8. Sometimes, not very frequently, the fan starts to make rattling noise even on idle, the only way to stop it it's to close the lid. – Weights only 100gr less, but feels more lighter than that. 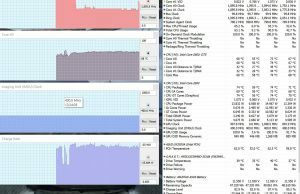 – I notice the system a bit faster, is i5 6th vs i5 7th gen, that's not much difference, maybe my ux305 needs some system clean up. 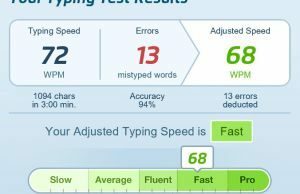 I will return the lap and keep my ux305, the keyboard is a deal breaker, i can't stand going back to fix my words all the time, or to be "alert" and make sure i'm not pressing the corner of the key. The fan thing is quite tolerable, since it doesn't happends too often and the solution is easy.